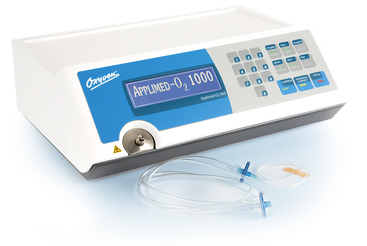 Oxyvenation therapy according to Regelsberger means slow intravenous intake of small amounts of medical oxygen for therapeutic purposes. The purpose of the oxygen supply is not an increase in the oxygen pressure in the blood, but an attraction of the oxygen bubbles on the inner lining of the blood vessels with subsequent therapeutically useful reactions. We use intravenous oxygen therapy primarily for immunomodulation. The smallest oxygen bubbles in subtoxic amounts produce eosinophilia in the blood. The emigration of eosinophils to the tissue is inhibited by various mechanisms. Allergic reactions in the tissue, which are classically characterized by an increased occurrence of eosinophils in the tissue, subside. Body antioxidant protection mechanisms are activated by the oxidative stimulus. In addition, there is a release of prostacyclin, hemoxygenase-1 and the recruitment of endothelial progenitor cells (EPCs) to repair damage to the vascular dothel. Dr. med. In his monograph on intravenous oxygen therapy, Franz Kreutzer describes the various mechanisms of action in detail and proves them through numerous studies.